1 1/8" Models Weigh 2 lbs 5.6 Oz. MAKE CERTAIN YOU HAVE A DEVICE TO RETAIN THE BRAKE PEDAL PUSHROD IN THE MASTER CYLINDER! Brake pedal rods have a habit of falling out of the master cylinder under vibation, misadjustment or just plain bad luck. Either build or buy some device to make it impossible for the brake pedal pushrod to fall out of the master cylinder!!! For 3AN Male to 1/2-20 Inverted Flare Rear Outlet get Strange PN	P2356 (Summit STR-P2356) *Note the rear port on most of these Master Cylinders is machined deeper than standard, not all 1/2-20 Fittings will work. Jerry Bickle, Quartermax, ART and others sell 1/2-20 and 9/16-20 banjo fittings with either 3 AN male, or 1/8 npt female outlets which, while they aren't cheap, might work well for tight installations. 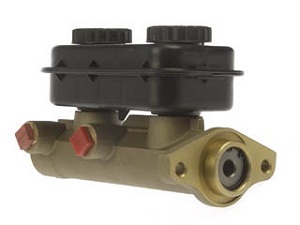 Another plus is the fitting depth into the Master Cylinder won't matter with this fittings. Reference Jerry Bickle PN's JBRC5032-2 and JBRC5032-1. Replacement Gaskets for Chrysler Master Cylinder Caps NAPA PN #675-1219 ( NOE 6751219). Should fit Strange M/C also. You will likely need to slot the mounting bolt holes in order to bolt up to GM OEM mounting studs.